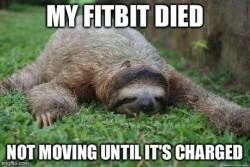 A few weeks ago, my Fitbit (one of my new favorite devices) died. Not died, as in bricked; my battery died. The next day, I went back to the Fitbit website to sign-up for SMS notifications; unfortunately, Fitbit doesn’t provide a low battery notification via SMS. So, I built my own, using a handful of AWS services (Lambda, SNS, API Gateway, and DynamoDB) and exposed Fitbit APIs. So far, it works well. After subscribing to the service, I got an introductory note telling my my battery status. A few hours later, I received a second notice – letting me know that my battery was low. I’ve made the service available on the site – http://darianbjohnson.com/send-fitbit-low-battery-notification-via-sms/. Feel free to test out the service (you can opt out any time my removing access through your Fitbit account). I’ll share the code and my logic in a later post. Maybe the Fitbit engineers will read this and incorporate SMS functionality in their devices. I supposedly got a notification through the Fitbit app as well, but I never saw it.